BlackBerry KEY2 Goes Through JerryRigEverything's Tests, Holds Up Well - AndroGuider | One Stop For The Techy You! The KEY2's predecessor, the KEYOne, had problems with its screen. JerryRigEveyrything found in his durability test of the KEYOne that the screen wasn't properly glued to the frame of the phone, and as a result, it randomly fell off for some users. After the issue was brought to light, BlackBerry acknowledged it and took measures to correct it. The later batches of the KEYOne were found to be structurally sound. BlackBerry released the KEY2 last month, and JerryRigEverything posted a durability test video of the device earlier today. Let's see how the KEY2 fared. In the scratch test, the KEY2's 4.5-inch screen started getting scratched by a level six Moh's pick. The front-facing camera, which is covered by the Gorilla Glass 3 as the screen, was just as scratch resistant as the display. The earpiece was found to be made of plastic and it is tugged well inside, meaning it won't be falling out on its own. All the keyboard keys, except the spacebar, are made of plastic. The keyboard keys got detached only after a lot of force was applied, so the keys should last well into the future. The spacebar, which doubles as a fingerprint scanner, couldn't be scratched. The material of which the spacebar is made of is unknown, but it's not plastic. The back of the KEY2 is made of rubber, while the sides and the buttons are of metal. The rear dual cameras have a glass covering and the flash is covered by a plastic lens. The KEY2's screen lasted 13 seconds in the burn test. The pixels that were exposed to the flame turned black, but since the screen is an IPS LCD, the pixels recovered to their original form. 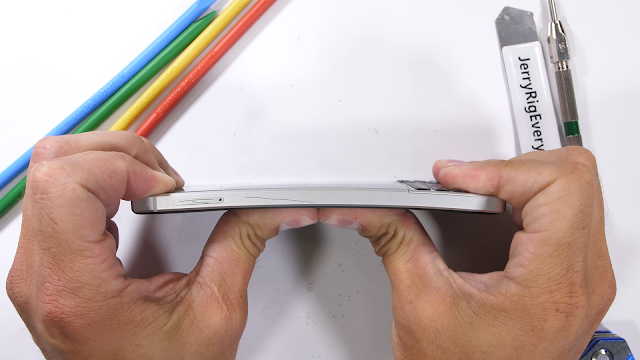 The phone hardly flexed during the bend test, and there was no damage. If you wish to watch the 'Art Class with Jerry' or want to hear the screeching sound of metal, you can check out the video embedded above or click on the link in the source to view the video on YouTube's website (or app).